Food Blogga: Celebrate Cinco de Mayo with Bacon Guacamole! Celebrate Cinco de Mayo with Bacon Guacamole! May 5th is Cinco de Mayo, the day when Mexicans commemorate their victory over the French in the Battle at Puebla of 1862. In the Mexican town of Puebla, schoolchildren will study history, artists will sing and dance and chefs will cook traditional foods, all to honor their brave ancestors. And in cities throughout America, Americans will get drunk. Somehow, this day of national pride for Mexicans has become another excuse for Americans to get sloshed. Think I'm exaggerating? According to Time magazine Cinco de Mayo is the 4th drunkest holiday of the year. 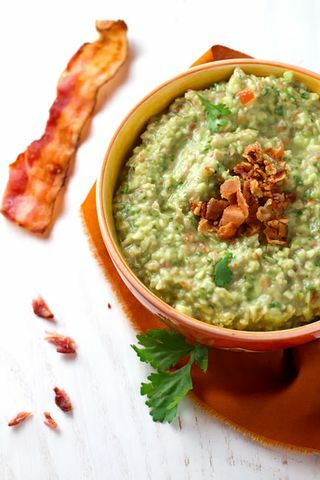 How about this year you get drunk on bacon guacamole instead? If you think traditional guacamole is irresistible, then be prepared to get punch drunk in love with this porky version: Classic creamy guacamole is studded with nibs of salty, smoky, crisp bacon. And in case you're wondering, yes, bacon guacamole does taste better if you eat it while wearing a sombrero and shaking some maracas. Like this recipe? 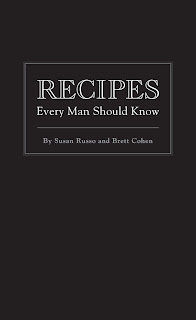 There are over 60 more like it in my book, Recipes Every Man Should Know, co-authored with Brett Cohen. It's a little, sleek black book that fits neatly into every man's back pocket. 1. Place bacon in a skillet over medium-high heat and cook until crisp. Drain on a paper-towel-lined plate. Let cool and chop into small pieces. 2. Combine remaining ingredients in a blender or food processor and pulse until chunky. Photo credit by Sala Kannan of www.veggiebelly.com. If you're a fan of bleu cheese, throw some in your guacamole (to taste). I saw this on Food Network and gave it a try and LOVED it. 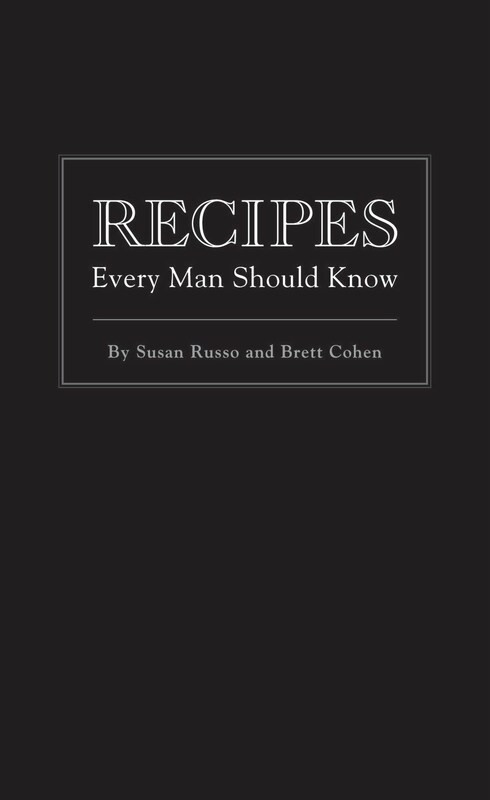 Every man, woman and child should get to know this guacamole with bacon Susan. I love guacamole and add some bacon? Well we all know that everything is better with bacon! sheila-It's a revelation. Trust me. anonymous-Oh, my husband would LOVE that idea. Thanks for sharing. val-Ha! I think so too. deborah-A girl after my own heart. I will absolutely for sure NOT be getting drunk...actually I don't think I've EVER gotten drunk on cinco de mayo. Well, maybe on guac. If that's your definition of drunk. This sounds delicious! Oh wow. I love guac and it's hard to improve upon a good thing, but if there is one way to improve on it, then it would defintiely be ADD BACON. Two great tastes that taste great together for sure! That bacon-addition sounds like a very good idea indeed. Do I understand it correctly that you blitz some of the bacon with rest of the ingredients and use some as a crispy garnish? joanne-Getting drunk on guac is definitely the way to go. You'd think by now I would have figured out that bacon goes in guacamole considering I LOVE smashed bacon on a good California Club. YUM! Genius! I'm thinking why I never thought to do so.... Thanks for sharing! Thanks so much for sharing your advice and wisdom at Camp Blogaway last weekend. I didn't get a chance to chat with you, but I look forward to following your blog! Your post just give me a new recipe to be served for my family. I really its name "Cinco de Mayo with Bacon Guacamole!" very historic and as well as delicious. Thanks for sharing! Bacon Guacamole? You have officially ousted the dog as "man's best friend"! Really, really love bacon guacamole. On everything! Ive never seen bacon look so elegant crumbled on a table. This looks like an awesome recipe. What would be better than bacon and avocado?